For many centuries, the singing of psalms has played an important role in religious gatherings. Evolving from simple melodies to complex four-part harmonizations and beyond, the singing of psalms has changed, but its presence remains constant. 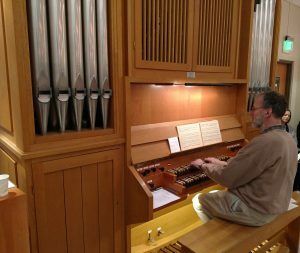 In many traditions, organists are expected to be adept at incorporating psalms into liturgy. 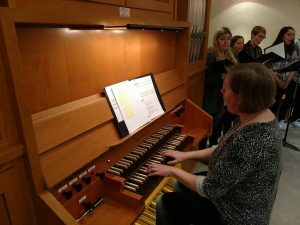 On November 12, 2018, Sheila Bristow, sub-dean and program chair of the Tacoma Chapter of the AGO, addressed this expectation with a practical program directed toward organists and choir directors who need a working knowledge of psalm settings. David Dahl, Organist Emeritus at Pacific Lutheran University, introduced the meeting with a short history of the Bosch Organ in the Ness Family Chapel. Paul Tegels, faculty member at Pacific Lutheran University, then opened the program with some comments about Claude Goudimel, a sixteenth-century French composer who set all of the psalms to four-part harmony. 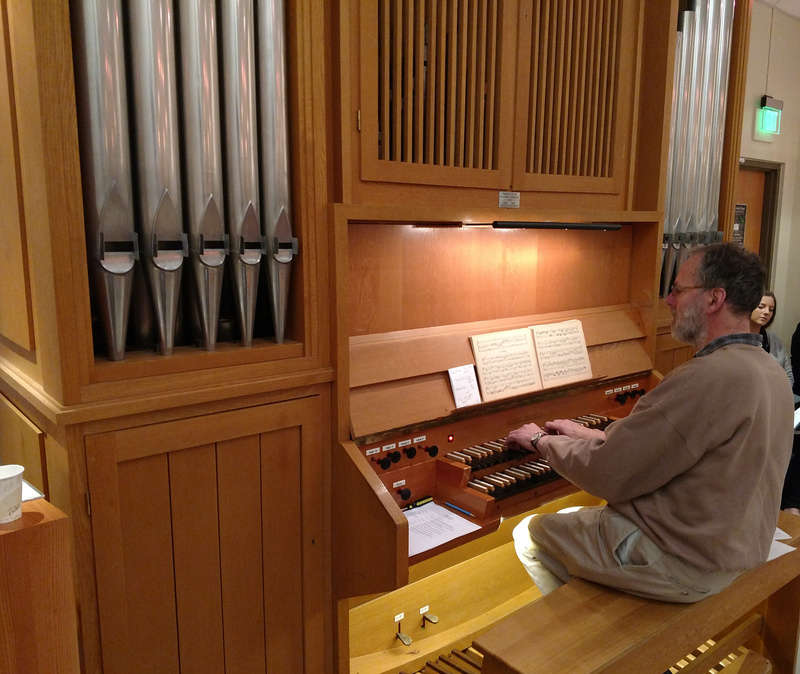 Paul played an introduction to Psalm 7 by Goudimel, with melody in the tenor, following which the audience sang Psalm 7. Psalm 7 ended with two organ verses by Anthoni van Noordt, a seventeenth-century Dutch organist. Sheila Bristow, our program chair, has served as Organist and Choirmaster at the Episcopal Church of the Redeemer, Kenmore, since 2005. Prior to that, she served for ten years as Organist at Seattle’s University Unitarian Church. In transitioning from a Unitarian job to an Episcopal job, she found herself needing to incorporate a psalm each week. The easiest solution to congregational psalms is the metrical psalm, much like a hymn but with a text derived from a psalm. Every hymnal has a few; the Presbyterian Hymnal has many, most of them being derived from the Scottish Psalter. 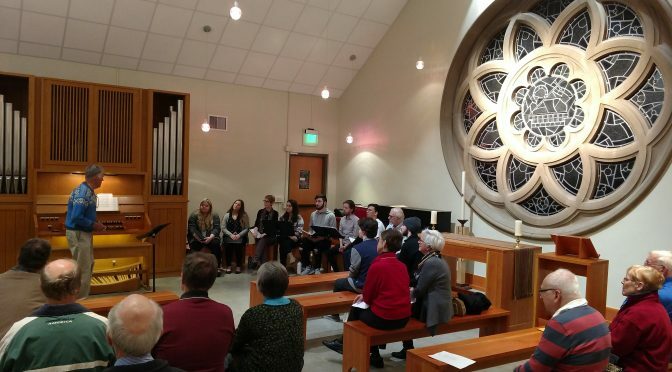 With the assistance of a choir composed of PLU students, faculty, and an AGO board member, Sheila demonstrated various styles of psalm settings. Many of them include an antiphon–a short chant that is used as a refrain. The antiphon is often monophonic and is often sung by a congregation in alternation with a choir singing the verses in a more complex setting. Beginning with a psalm suitable for use in Advent, Psalm 126, the choir sang an antiphon based on plain chant, alternating with the congregation singing verses set by Richard Proulx, an American composer of church music. This example represents an interesting departure from the usual practice of having the congregation sing an antiphon alternating with the choir singing verses. Moving on to Christmas, Psalm 96 was presented with a congregational four-part antiphon and descant added by Sheila, alternating with choir verses sung to harmonized plainsong. Anglican chant is a genre that sets unmetered text to four-part harmony. It often has multiple harmonic changes per phrase and can be difficult for congregations. Psalm 16 was presented by the choir in a four-part setting by Edward Bairstow (1874-1946), an English composer and organist. 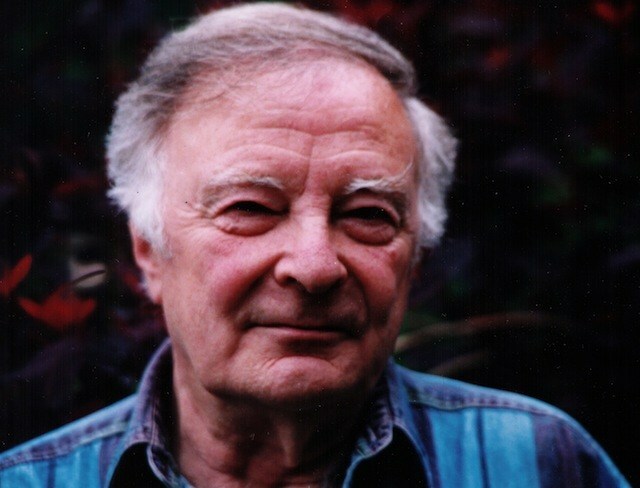 Peter Hallock (1924-2014) is well known in the Pacific Northwest as an organist and composer. 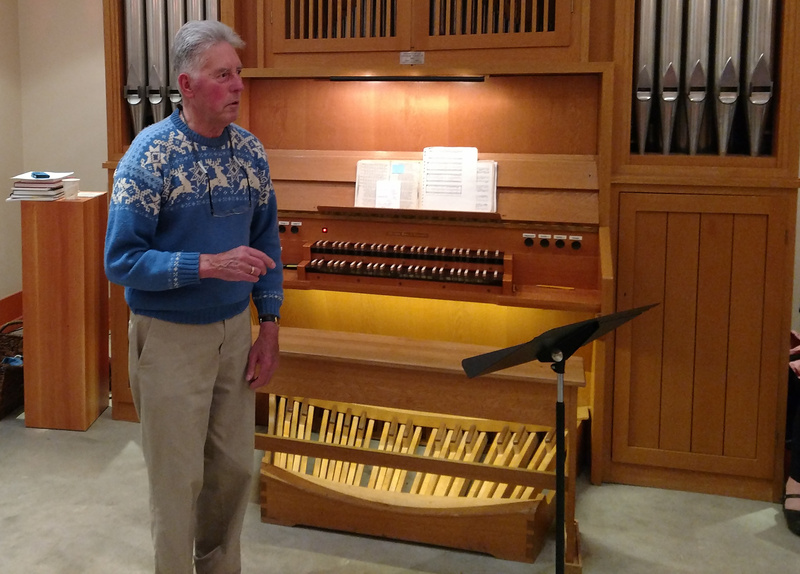 He served as organist and choirmaster at St. Mark’s Cathedral in Seattle for forty years. After his retirement in 1991, he continued to conduct the Compline choir until 2009. Sheila points out that his psalm settings often show a great understanding of the text, using as an example a setting of Psalm 104 which alternates a monophonic antiphon for congregation with four-part verse settings for choir based on open harmony and parallel fifths. Simplified Anglican chant is similar but has only one harmonic change per phrase. James Frazier set Psalm 23 in such a way, making it easier for the congregation to participate. His setting appears in the “uncharted area” of the service volume of the Episcopal 1982 hymnal. Thomas Stratman (1939-2008) was associated with St. James Cathedral in Seattle for many years. Sheila used his setting of Psalm 131 to illustrate a more contemporary psalm setting but still matching a monophonic congregational antiphon with a more harmonically complex verse setting sung by the choir. The handout, including all of the musical examples, is reproduced below. Selecting the handout will activate controls that allow scrolling. Many thanks to Sheila Bristow for preparing this program, to the members of the choir for bringing the music to life, to Paul Tegels for demonstrating the organ, to Satya Jaech for preparing the wine and cheese reception afterward, and, of course, to David Dahl for his vision in convincing the PLU Class of 1960 to choose an organ as their class gift.